Home > Economics help blog > economics > Is a strong economy generally accompanied by a strong currency? However, there is no guarantee a strong economy will lead to an increase in the value of the currency. A strong economy could – in some circumstances (weak export growth, rising inflation) – lead to a fall in the value of the currency. Also, exchange rates can move due to market sentiment (e.g. correcting an overvaluation) that have little direct link with economic performance. A high rate of economic growth. This means an expansion in economic output; it will lead to higher average incomes, higher output and higher expenditure. High consumer and business confidence. Why does a strong economy cause a strong currency? In the post-war period, Germany and Japan both had strong economic performance which was characterised by high levels of investment and rapid growth in productivity and competitiveness. Due to these productivity gains, German and Japanese exports become increasingly competitive in the global market. There was a rise in demand for their exports. This, in turn, caused a steady appreciation in the German mark and the Japanese Yen. The economies were characterised by high growth, low inflation and a steady appreciation in the currency. Countries with a strong track record of economic growth, political stability and a stable currency will attract investors wishing to take advantage of the stability in the economy. Investors are more willing to save in dollars and Euros because traditionally these currencies hold their value well – due to relatively strong and stable economic performance. By contrast, an economy with a track history of weak performance (poor growth, volatile inflation rate), then the currency is much more likely to be volatile. For example, a fall in the price of oil caused investors to sell currencies like the Russian Rouble and Venezuelan Bolivar – as with lower oil prices, these economies became much weaker. In the shorter term, if an economy experiences relatively high rates of economic growth, then the economy is likely to see rising interest rates as the Central Bank respond to higher growth and potential inflationary pressures by putting up interest rates. These higher interest rates lead to ‘hot money flows’ where foreigners wish to save in that country to take advantage of better returns. This causes an appreciation in the exchange rate. Since the US exited recession in 2010, the US economy has performed more strongly than many of its competitors such as the Eurozone, Japan and UK. US growth has been higher and unemployment has fallen to 4%. As a result, the US has increased interest rates faster than some of its main competitors – Japan and Eurozone. As a result, since 2009, the dollar has appreciated by approximately 20%. This supports the view that a period of strong growth leads to a strong currency. This period has also been one of economic uncertainty with the world economy still struggling with the fallout from the financial crisis. The US dollar has an added attraction for its reputation as a global reserve currency – a relatively safe bet compared to the alternatives.. This shows that in the short-term, the link between a strong economy and a strong currency can break down. What was happening in 2008-09 was that a global crisis of confidence caused investors to pull out of emerging markets and seek ‘relative safety’ in the US. Therefore, despite a very weak economy in the short-term, the dollar appreciated. In this case, the dollar appreciation was more due to the US long-term reputation. The 1990s, the strong economic performance led to an appreciation in the dollar – as might be expected. However, the period 2002 to 2008 was also a period of strong economic performance, but this saw a prolonged depreciation (of approx. 25%) in the dollar. In the 2000s, it would seem the relatively strong US performance had a negative correlation with a strong dollar. 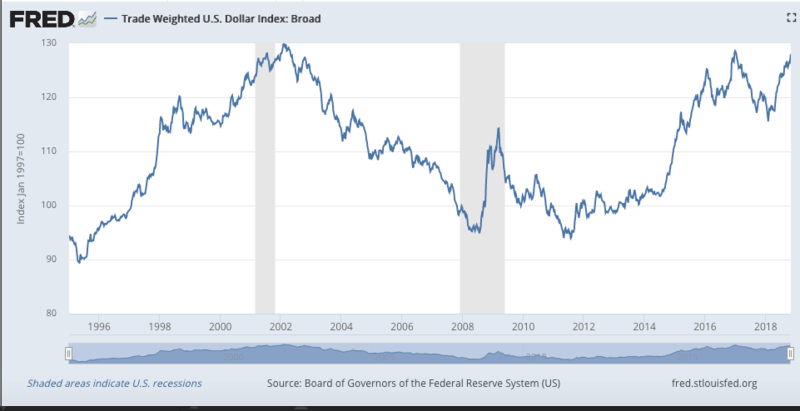 Why was the dollar weak in the 2000s? Large current account deficit. US growth in the 2000s was characterised by a current account deficit (imports greater than exports). The growth was unbalanced, a current account deficit tends to put downward pressure on a currency as demand for buying foreign goods is higher than domestic goods. This shows that it depends on the type of ‘strong economic growth’ If growth is export-led and caused by rising productivity, this tends to lead to better performance of the currency. If growth is consumer-led – and reliant on imports – this tends to cause a weaker currency. Another factor is that currencies are traded on currency markets and can be subject to market sentiment. Sometimes a prolonged deterioration in the currency may be a simple ‘market correction’ to a previous overvaluation. There is not always a direct link between a currency and economic performance. You get productive and competitive > Your exports increase > gdp rise and better living standard > more demand on your currency > currency appreciates > lower exports > gdp decline and lower living standards > what to do? > You get productive and competitive… and so on. A country like Qatar has a very high GDP. People are extremely wealthy. Really high PPP. High exports. Growing economy. Steady interest rates. Is it a good economy? Well, no. It’s not based on productivity. It’s dependent on one single natural resource (oil). If it gets cheap, they lose everything with zero know-how. Basically starts from zero.